"On-line gaming environments are completely different things... Essentially it's massive global role-playing." Very thorough description of a space suit; see additional comments for other references. "There is one thing I do not yet understand, Gus. How in the world can a person live in a spaceship, in which he has none of the prerequisites for existence, air, pressure, heat and even weight?" "...naturally the crew must be able to leave the spaceship." "Not only on the moon but also during the trip through space, sir!" Isn't that a mere fancy said the Russian skeptically. He regarded the scheme as madness. Korf opened the doors of the chamber built into the wall, entirely finished in rubber and provided with an airtight door. "Two things (aside from cold which can be overcome) seem to make a stay in space impossible for human beings; the absence of pressure and the lack of air. I'm going to pump the air from this room, which really amounts to nothing more than a laboratory flask on a large scale, so that the interior will be like airless and pressure-less space." With great excitement the visitors watched Korff take from the drawer a bundle, which he opened up. "This is a suit made from rubberized leather, like a diving suit, and absolutely airtight. By means of a special air magazine so much air is constantly produced in the suit that there is a constant pressure of one atmosphere, regardless of the external pressure. From The Shot Into Infinity, by Otto Willi Gail. As far as I know, the earliest specific reference to the idea of a space suit is in Edison's Conquest of Mars, an 1898 novel by Garrett P. Serviss; see this article on air-tight dress. The earliest use of the phrase "space suit" that I've found is from The Emperor of the Stars. a 1931 short story by the great team of Schachner and Zagat. ; see space suit. 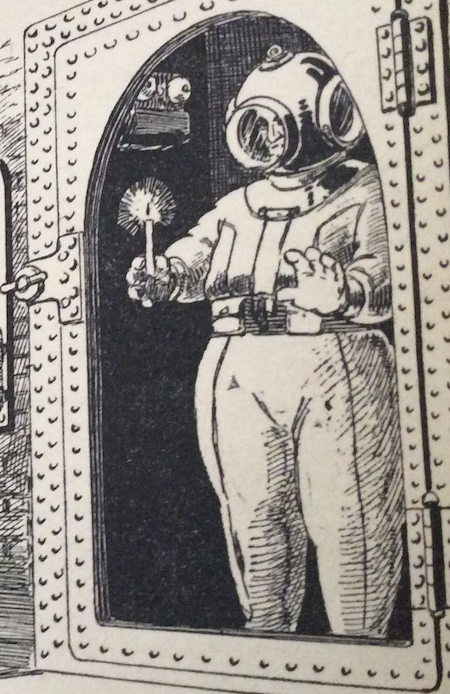 Also, see the somewhat less formal space overalls from Lost Rocket, a short story by Manly Wade Wellman.